Emplacement . . . Emplacement . . . Emplacement . . . Sur le lac Michigan / Little Traverse Bay. Idéal pour des vacances en famille. À quelques pas de l’eau, plage de sable, parc, port de plaisance, jetée, piste cyclable, Bear Creek et le charmant village de Petoskey. Courte distance en voiture ou à vélo vers Charlevoix et Harbour Springs, 3 km du nouveau casino Odawa et près de tous les sports d’hiver. La maison se trouve au premier étage. Une chambre à coucher à l'étage pouvant accueillir 4 personnes est également disponible. My husband and I stayed here with our two year old. We all loved Petoskey, and this is the perfect house to experience it all. You can easily walk uptown to all the restaurants and shops. You can step out onto the front deck and watch the boats come into the marina. The bike bath is literally steps away. The house had more than enough room for the three of us, and had everything we needed. Jeff and Leslie were easy to communicate with as well. Looking forward to coming back in the future. Great location and convenient parking. 1. Vacuum hadn't been cleaned in who knows when. Roller wouldn't turn because it was knotted with hair and who knows what. 2. Sheets for pull out were WADDED UP ...not folded, in closet. Had to re wash because they were so wrinkled. 3. When we checked house before leaving, found little girl underpants under bunk beds. Grossed out young grandsons who slept in that room. 4. Baseboards in bathrooms filthy as well as window sills in major living area. I am sorry to hear that you experienced poor service from our housekeeping service. We have used MaidPro housekeeping for more than 5 years and previously only experienced minor issues. Once we were alerted to your issues we did a quality control inspection after a cleaning. We contacted the owner of MaidPro and informed him that we would not continue using their service unless the housekeeping quality was addressed and the existing crew will never be assigned to our home again. We have received an assurance that the situation would be corrected. We also have initiated an e-mail survey upon check-in for future guests that would provide immediate feedback, and allow us to address any problems, including housekeeping, immediately. Again, we apologize and appreciated your feedback that helped us correct the housekeeping issues you noted. My family of five really enjoyed our stay at this house for our annual summer trip up north. As shown in the pictures, it has a great view of Little Traverse Bay and is steps from spacious Bayfront Park. 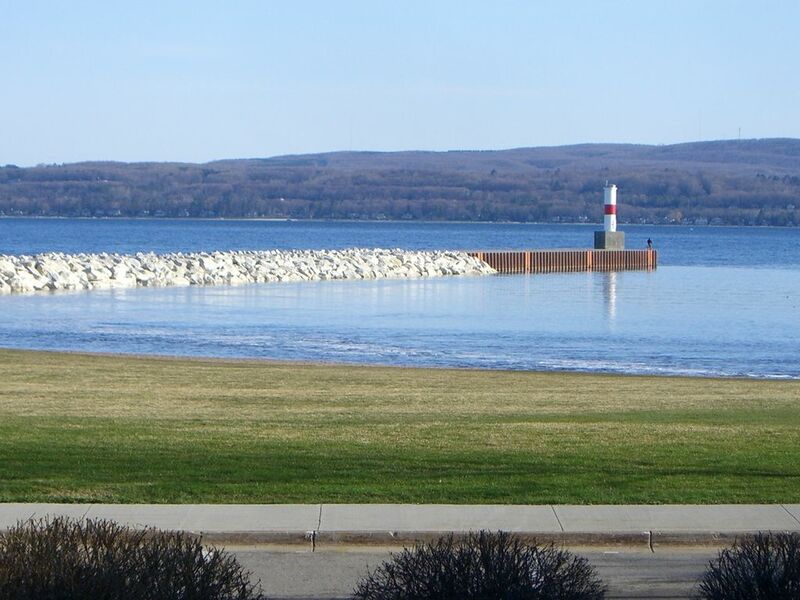 Everything Bayfront Park (breakwater, playground, concessions), nearby Magnus Park (great for Petoskey stone hunting) and downtown Petoskey have to offer is within walking distance, even with young children. If you're looking for a sandy beach on Lake Michigan, Petoskey State Park is only a 10-minute drive and wasn't too crowded either day we visited. The house itself is also really nice, from the décor to the furniture, and well appointed. Unlike some other VRBO experiences we've had, the owners provided ample towels, linens and cleaning supplies. There was plenty of room for the five of us (two adults, three children). We would definitely return. We've tried lots of places, and Petoskey is our favorite vacation spot in northern Michigan. And you can't beat the ice cream at Murdick's. The location and view are what really make this a great place to stay. In the ground floor rental you can see Little Traverse Bay from the open living area of the kitchen, dining and living rooms. Also has a nice deck with the same view. We Walked across the street each night and strolled out on the break wall for the sunset. It’s an easy two block walk into downtown Petoskey, which is such a charming area with lots of shops and restaurants. We rented bikes and loved that the Little Traverse Wheelway was right out your back door. Ride it to Harbor Springs (9miles) or the beach at the State Park...closer. The house itself is updated and comfortable. Someone in our group Likened it to a Hampton Inn verses say a Hyatt Regency, but I would say it’s nicer than a Hampton Inn. It was spacious for our family of four and it had everything we needed. I would definitely stay again! Perfect and great location. We never had to get in our car. The property was awesome. We enjoyed the view of the bay. Totally enough space for my family of 5. We will come back to this location and place again. Great location, inside of house was updated, clean.